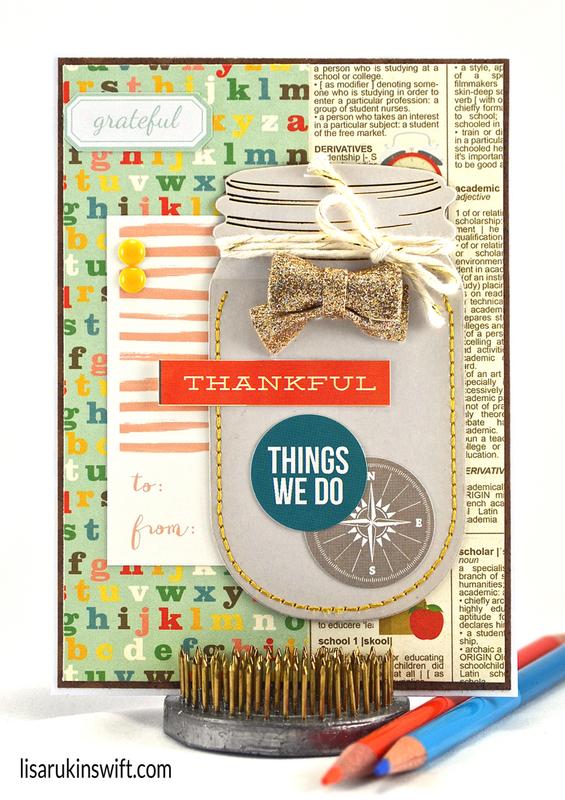 Love the colors of your card, Lisa, they have such a cozy autumnal feel! Loveeeeeeeee this! LOVING that jar and the bow!!!!!!!!!!!!!!!!!!! Love it. That jar is sooo cool. Beautiful!! LOVE the jar and the gold bow!! I really like this card and almost bought that Teacher's Pet ABC paper as a result! It was in my cart and I took it out. Looking at your card again, I should have bought it! As always, you combine papers and textures so well. Great card, Lisa. I think any teacher would feel like she shined if she received this card - what a tribute fitting for the best teacher ever!!! Love the mason jar and how you have stitched it! !